What’s Next for Venezuela’s Recall Referendum Push? Even in the face of mounting obstacles, the Venezuelan opposition is planning a major protest on September 1 to push for a timely vote to remove President Nicolas Maduro and hold new elections. But given the procedural hurdles and allegations of intentional delays, is it still possible for such a vote to be held before a January 10 deadline? On August 9, Venezuela’s opposition received a major blow to its morale: National Elections Council (CNE) President Tibisay Lucena announced that the next step in the effort to trigger a recall referendum against President Nicolas Maduro—holding a signature drive to reflect support for a vote among 20 percent of the electorate—would “probably” take place in October. Given the tight timetable for the process, and that the CNE has been generally slow to review each step, the odds seem slim that a final vote will occur before the January 10 deadline to remove Maduro from office and hold new elections. The stakes are high for both the opposition and supporters of the ruling Socialist Party of Venezuela (PSUV). If the vote occurs before January 10, and enough people support it, it would trigger the election of a president to finish the final two years of the presidential term through 2018 (which 75 percent of Venezuelans say they want to see, according to Datanalisis). But if it happens after, by law Maduro’s vice-president would finish his term. While the opposition Democratic Unity Roundtable (MUD) may be hoping that the CNE will speed up the process, the current pace gives little reason to expect this. 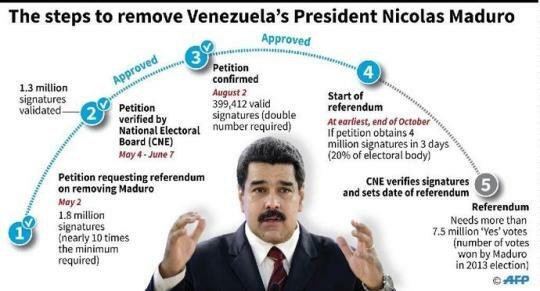 When the opposition presented roughly 1.9 million signatures to the CNE on May 2, electoral authorities took several weeks to review them before declaring on June 10 that over 600,000 of these were invalid. According to Lucena, among these signatures were nearly 11,000 which belonged to deceased individuals, and another 9,300 which listed nonexistent identification numbers (cédulas). The opposition has contested this, however, by claiming that much of these figures are due to errors committed by CNE technicians who reviewed the signatures. Beyond the dispute over signatures, the opposition has had to meet some very tight deadlines in order to pass the first stage of the referendum process. After the CNE certified the validity of the remaining 1.35 million signatures, the MUD was then faced with the task with getting roughly 200,000 who had signed the petition—a minimum of one percent of the electorate from each state—to validate it in person in their corresponding state capital. What’s more, this process had to be completed between June 20 and 24, and the CNE allocated only 300 fingerprint scanning machines for this step around the country. As Bloomberg reported at the time, this meant that voters waited for hours in long lines at poll centers. Once this process was completed, the CNE once again took longer than expected to review the verified signatures. It was not until August 1, over 30 days after the verification process closed, that electoral officials announced that the requisite number had been approved. The opposition can expect a similarly slow pace moving forward. In her August 9 statement, Lucena said that CNE was taking a 15-day period detailed in regulations to process the opposition’s request to begin collecting the 20 percent of the electorate’s signatures necessary to trigger a recall, followed by another 15 days “to present a proposal for the chronogram and the (signature) collection centers.” On August 29, CNE representative Socorro Hernández announced that the process of gathering signatures would take place from October 20-24. Previously, electoral officials have said that the final referendum would take place 90 days after the signatures of 20 percent of the electorate are approved. If signatures are gathered in late October, that would put the vote in late January at the earliest. However, a number of Venezuelan political analysts have questioned the legal basis for these periods of delay. Eugenio Martinez, for instance, has noted that much of the delay can be accounted for by additional requests made by the Maduro administration. Another open question regarding the next steps in the process has to do with the breakdown of the 20 percent signature drive. According to Hernández the CNE is still evaluating whether the opposition would have to gather 20 percent of the electorate at a national level, or whether this should percentage should be for each state. Electoral officials mandated the latter in the previous signature drive, which created significant organizing hurdles for the opposition. Of course, the MUD has not responded favorably to the CNE’s timetable. Following Lucena’s remarks, MUD leaders began calling for a massive opposition march on September 1, dubbed “The Taking of Caracas,” to demand that the CNE set a date for the signature drive to begin and allow the recall referendum to move forward. Jesus Torrealba, the leader of the MUD coalition, has described the main purpose of the protest as twofold: it will serve to organize and mobilize the opposition support base, as well as to build pressure on the government to ultimately allow a vote in 2016. MUD organizers are already drumming up their base for what they say will be a massive protest in the country’s capital, and have announced that the demonstration will start at seven separate “concentration spots” around Caracas. Meanwhile, the Venezuelan government has responded to the opposition’s planned protest in familiar language. On August 23, Vice President Aristóbulo Istúriz claimed that opposition leaders would “provoke people to shoot someone.” This is similar to officials’ claims regarding imprisoned opposition figure Leopoldo Lopez, who was jailed for allegedly inciting violence in public rallies to support the 2014 protests in which over 40 people were killed. This is playing out at the local scale as well. The head of the regional Capital District government of Caracas, Daniel Aponte, has said that the MUD will not be permitted to march in the Libertador municipality (making up the western half of Caracas) because it lacked permits. The government has also reacted harshly to the referendum initiative. Maduro, who has resolutely insisted that the CNE timetable cannot allow for a referendum this year, has also reportedly begun to purge supporters of the initiative from the public sector. According to press reports, last week Maduro provided five key cabinet ministers—the Ministers of Food, State Companies, Finance, Labor, and the Office of the President—with the names of employees who supported the referendum, ordering any who serve in management positions to be dismissed. Ultimately, the CNE’s slow pace and the sheer scope of what is at stake for the government in the referendum has led a number of analysts to conclude that a 2016 referendum—and thus a transfer of power from the PSUV to the opposition—is all but impossible. However, others including MUD leaders, Eugenio Martinez, and former opposition CNE rector Vicente Diaz—have in recent weeks expressed cautious optimism that a referendum before January 10 is still possible. If it becomes clearer that a vote before the deadline is definitely off the table, however, the coming weeks and months are sure to see deeper friction between the MUD and the Venezuelan government—especially combined with the country’s worsening economic situation. Meanwhile, the country’s neighbors have yet to articulate a consensus on a proper regional response. An effort to support dialogue, sponsored by a group of former presidents working under the auspices of UNASUR, seems to have come to a halt with neither side able to agree on a clear agenda for concessions. The Organization of American States (OAS) has declined to take drastic steps to address the polarization in Venezuela—despite Secretary General Luis Almagro’s continued urging—and the Mercosur trading bloc is split over whether to allow the country to take its turn on the rotating presidency of the body (citing human rights concerns). Such multilateral engagement is sorely needed at the moment to provide the Venezuelan government with incentives and opportunities to embrace dialogue. Not only could it help ease some of the country’s political tensions (and potentially pave the way to address the current economic woes), but it would also go a long way to prevent the ill-advised unilateral measures that some in the U.S. government are advocating for. As WOLA Senior Fellow David Smilde has pointed out, U.S. indictments of high level Venezuelan officials are already helping Maduro build a loyal core. Further unilateral measures or sanctions will only worsen the problem, and help cement this core’s opposition to any kind of potential transition.